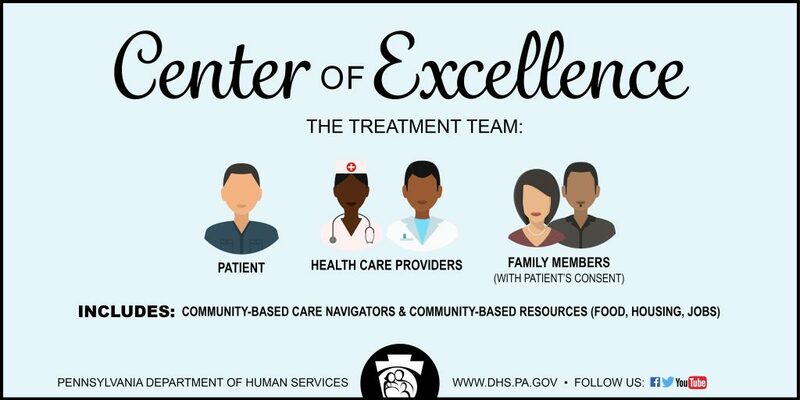 Centers of Excellence help ensure that people with opioid-related substance use disorder stay in treatment to receive follow-up care and are supported within their communities. Care management teams coordinate care and provide warm transitions to new parts of the treatment process. A common misconception about the Centers of Excellence is that they are only physical locations where people can walk in and receive treatment. While most of the centers will provide direct treatment, in reality when we use the term “center” we are referring to a central, efficient hub around which treatment revolves. 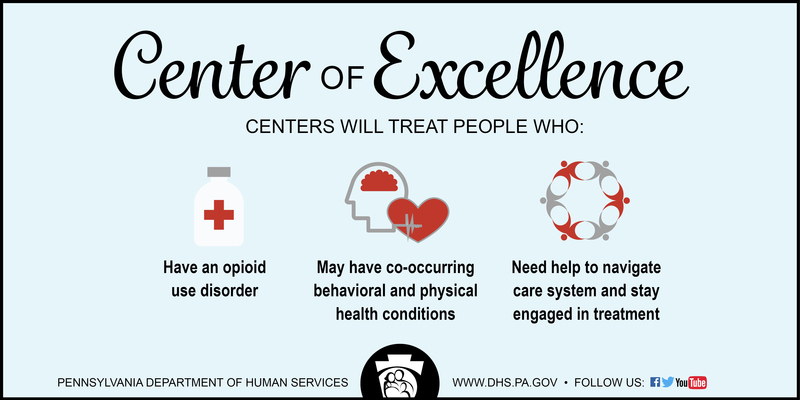 These centers will have navigators to assist people with opioid-related substance use disorders though the medical system, and ensure they receive behavioral and physical health care, as well as any evidence-based medication-assisted treatment needed. To better explain how Centers of Excellence work, let’s use an example. Meet Jane. Jane is suffering from opioid use disorder. When she decided to get treatment for her illness, she sought initial help at a health care facility – like a hospital, her primary care physician, or with a behavioral health specialist. Let’s say Jane went to her primary care physician – Dr. Smith. With informed consent, Dr. Smith notifies the Center of Excellence team that Jane is seeking treatment. A Center of Excellence health team professional – let’s call this person Tim – arrives on site and completes an assessment of Jane to determine her specific needs. Tim then develops a treatment plan for Jane that recommends the appropriate level of care. Tim then ensures coordination of Jane’s care with a Center of Excellence team. If Jane consents, her family can also be involved in Jane’s care. Other members of her Center of Excellence team may include behavioral and physical health care providers, community-based care navigators, and community-based resources that can help Jane obtain food, housing, and apply for jobs. Tim sets Jane up with Dr. Mansfield – a drug and alcohol (D&A) provider that will help Jane with her opioid use disorder. But in addition to her opioid use disorder, Jane also has anxiety and asthma. In order to help treat Jane as a whole person, Tim connects Jane with Dr. Boyer, a mental health provider that can help treat Jane’s anxiety, and Dr. Nolan, a physical health provider that can help treat Jane’s asthma. Behavioral health providers include mental health providers as well as D&A providers. D&A providers – like Dr. Mansfield – help provide evidence-based treatment which would include recovery supports, cognitive behavioral therapy, drug and alcohol counseling, rehabilitation services, and detoxification. Mental health providers – like Dr. Boyer – would provide evidence based treatment consisting of counseling or talking therapies and medications for conditions such as anxiety, severe depression, bipolar disorder, and schizophrenia. Physical health providers – like Dr. Nolan – would provide treatment for conditions such as diabetes, high blood pressure, asthma, heart attack, and seizures but could also treat anxiety and depression. Both physical health and behavioral health physicians that have specific training can provide medication assisted treatment for opioid use disorder with medications such as methadone and buprenorphine. Jane will receive all available supports coordinated by her Centers for Excellence team such as referral to employment services, housing support, legal support, and faith based resources. The care team, which is led and coordinated by Tim, oversees everything from the evaluation to the referral process, through follow-up care. This is how Jane receives the treatment she needs and starts on the path to recovery through the Centers of Excellence. Working with Tim, her family, Dr. Smith, Dr. Mansfield, Dr. Boyer, and Dr. Nolan, Jane is able to get the care that she needs. Governor Wolf’s 2016-2017 budget included $10 million in behavioral health funding and $5 million in Medical Assistance funding, totaling $15 million. This will allow DHS to draw down $5.4 million in federal funding for an overall total of $20.4 million. This critical funding will enable the Department of Human Services, during phase one, to implement 20 Opioid Use Disorder (OUD) Centers of Excellence that will treat approximately 4,500 people like Jane that currently are not able to access treatment. The Department is also working with its actuaries to determine the number of additional centers that can be funded with the $5 million in state Medical Assistance funds and $5.4 million in federal funds by analyzing the impact they will have on Medicaid managed care rates. 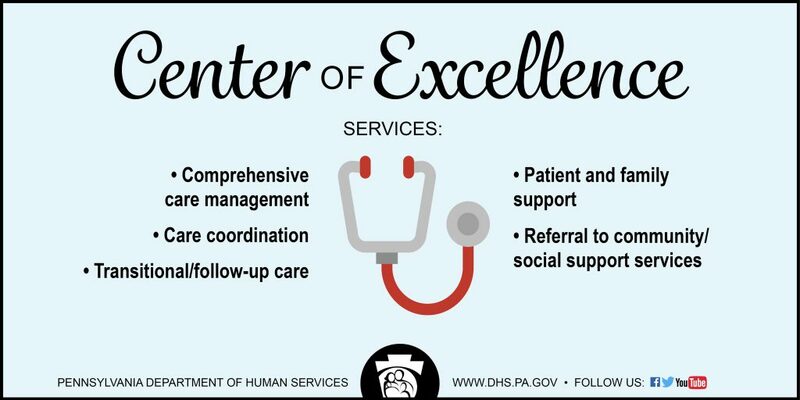 The Department of Human Services will announce any additional Medicaid-funded OUD Centers of Excellence in August.